Documentary produced by Jesus Gamarra and Jan Peter de Jong. Could Cusco have been Babylon the Great? 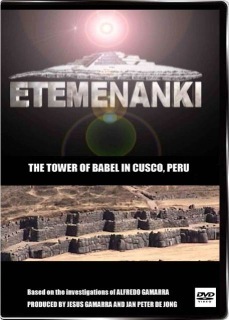 And Sacsayhuaman the Tower of Babel? Is Cusco in Peru, known as the old Capital of the Incas, the Ancient City of "Babylon the Great"? And could the most cyclopean structure on earth, just above and to the North of the City and known as Sacsayhauman, be the Legendary "Tower of Babel"? These questions are not that strange anymore once one understands that the most advanced and biggest stonework found in and near Cusco, has not been the work of the Incas but from a much earlier culture, a culture that was able to build the megalithic vestiges around Cusco and around the world. There are striking similarities to be recognized between those vestiges, explained in detail in our other documentary "The Cosmogony of The Three Worlds". It isn't that strange anymore either if one leaves behind the old paradigm of the American continent being "The New World". 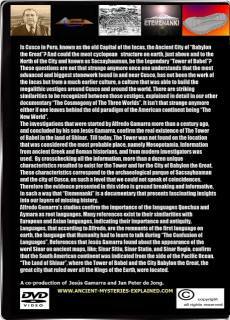 The investigations that were started by Alfredo Gamarra more than a century ago, and concluded by his son Jesus Gamarra, confirm the real existence of The Tower of Babel in the land of Shinar. Till today, The Tower was not found on the location that was considered the most probable place, namely Mesopotamia. Information from ancient Greek and Roman historians, and from modern investigators was used. By crosschecking all the information, more than a dozen unique characteristics resulted to exist for the Tower and for the City of Babylon the Great. These characteristics correspond to the archaeological parque of Sacsayhuaman and the city of Cusco, on such a level that we could not speak of coincidences. 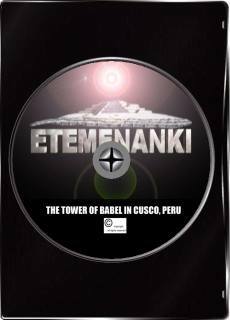 Therefore the evidence presented in this video is ground breaking and informative, in such a way that "Etemenanki" is a documentary that presents fascinating insights into our layers of missing history. Alfredo Gamarra's studies confirm the importance of the languages Quechua and Aymara as root languages. Many references exist to their similarities with European and Asian languages, indicating their importance and antiquity. Languages, that according to Alfredo, are the remnants of the first language on earth, the language that Humanity had to learn to talk during "The Confusion of Languages". References that Jesus Gamarra found about the appearance of the word Sinar on ancient maps, like; Sinar Sitiu, Sinar Statio, and Sinar Regio, confirm that the South American continent was indicated from the side of the Pacific Ocean. "The Land of Shinar", where the Tower of Babel and the City Babylon the Great, the great city that ruled over all the Kings of the Earth, were located. Produced by Jesus Gamarra and Jan Peter de Jong. The DVD is available in English and Spanish. The price is $20,-, shipping is free all over the world! New! Also available as a download for viewing on PC, Apple, Ipod and Ipad for only $9,99. Please take into acccount that it can take till 1 day before you will receive the downloadlink by email, thanks!